The fully enclosed 2-personTent Cot creates a private sleep shelter and brings a level of convenience tooutdoor outings not typically found with old style camping gear. The sturdyaluminum frame keeps you 12" above the ground to provide comfort and protectionfrom insects, rocks and dampness. The quick, easy set up can be done alonewithout the help of an extra pair of hands, making it the ideal solution to getout and enjoy the Great Outdoors more often and more comfortably. 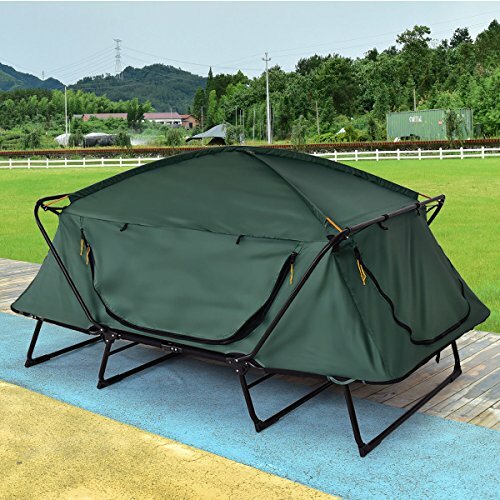 Folded Size In Carry Bag:32"×49" ×8"
【Durable & Comfortably】The Tangkula double tent cot is made of heavy duty 420D PU coated oxford tent and rain fly is designed to handle most wet weather conditions. And it features large D-Shape screening doors with zipper for easy entry. It's your ideal choice. 【Space-saving & Easy to Carry】The Tangkula double tent cot is a perfect rest solution for outdoors. It uses a foldable design, Folding it and put it into the carry bag when not in use to save space. It doesn't occupy space, but also easy to carry. It is suitable for picnic, camping, tourism and other outdoor activities. 【Moisture-proof & Pest Control】The sturdy aluminum frame keeps you 12" above the ground to provide comfort and protection from insects, rocks and dampness. And it features breathable micro mosquito mesh. So that you can get the best outdoor rest environment. 【Easy to Assemble】The Tangkula double tent cot are easy to assemble and the all required accessories are included,. You can quickly assemble the item and use it in a clear and easy-to-understand manual. 【Shipping & Customer service】Ups or usps will deliver the item to your house in 3-6 business days after you placed an order. We packed this double tent cot as good as we can, if there is any part missing or damaged during shipping, please contact us first and offer us pictures of damaged part, we will solve the problem as the way you want.